Constructed wetlands are designed specifically to remove nitrogen from agricultural drainage systems. A shallow wetland pool is created to generate conditions favorable for denitrification. Constructed wetlands are specifically designed for nutrient removal but do create wildlife habitat as well. Constructed wetlands are built in areas that were not previously considered to be wetlands and can intercept tile drainage prior to discharging to a stream. The wetland must also be located out of the 100-year flood plain. Constructed wetlands perform a similar function to the Iowa CREP wetland program in that they are designed to remove nutrients from drainage water prior to reaching the stream, but they are at a smaller scale. 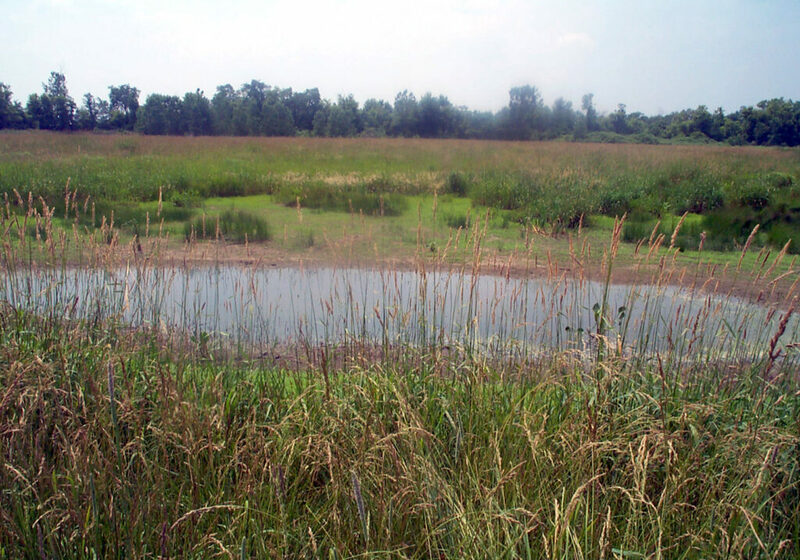 Constructed wetlands typically treat 30 – 200 acres whereas Iowa CREP wetlands have contributing areas of 500 – 2000 acres. Constructed wetlands must be 1% of the contributing drainage area to meet NRCS standards. It is recommended that the constructed wetland be as large as 5% of the drainage areas. Performance varies and is generally related to the wetland to drainage area ratio. As the ratio nears 2%, nitrate reductions of >50% can be realized. Constructed wetlands are eligible for financial assistance through the NRCS EQIP Conservation Practice Standard 656. There may also be state initiatives or private funding available in your area. Please refer to the ADMC Financial Assistance page for projects in your area.